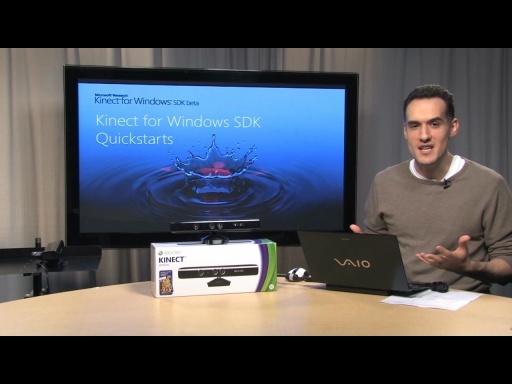 Please use the newly updated Kinect for Windows SDK Quickstart series. The content below will only work with the Beta 2 version of the Kinect for Windows SDK. This video covers how to set up your development environment. You may find it easier to follow along by downloading the Kinect for Windows SDK Quickstarts samples and slides that have been updated for Beta 2 (Nov, 2011). The Microsoft.Research.Kinect DLL version is now 1.0.0.45. The requirements for DirectX samples have been clarified to say that they are only required for C++. The speech sample requirements have been updated for Beta 2. If you are using an x64 PC, note that you should install both the x86 and x64 Speech Platform Runtime (see Speech samples below). The source code for shipping examples is now in "\Program Files\Microsoft SDKs\Kinect\v1.0 Beta2\Samples\KinectSDKSamples.zip"
The Kinect runtime now provides a StatusChanged event that will fire if a Kinect is connected, disconnected, and so forth. See below for a code snippet for how to subscribe and handle the StatusChanged event. For an example on setting up and handling Kinect connect/disconnect events, refer to the ShapeGame sample. For an example on how to show two Kinects at the same time, refer to the SkeletalViewer sample. Some samples use DirectX and the Microsoft Speech APIs. For these demos to work, you must download the correct pre-requisite software. Microsoft Speech Platform Runtime, version 10.2 – select 32-bit if you are running 32-bit Windows. If you have 64-bit Windows, we suggest that you install both the 32-bit and 64-bit runtime. Visual Basic / C# – In the Add Reference dialog, switch to the .NET tab, click the Component Name header to sort references alphabetically, then scroll down to select Microsoft.Research.Kinect and click OK. Make sure to select 1.0.0.45. Go to http://c4fkinect.codeplex.com and download the latest version of the Coding4Fun Kinect Toolkit. This library is filled with useful items to help with a variety of tasks, such as converting the data from the Kinect to a data array or Bitmap. For NUI, we have to initialize and uninitialize the runtime. In our examples, we typically will initialize on the Loaded event on the Window and we'll uninitialize on the Closed event. Depending on what needs to be done, the Initialize method on the runtime will be tweaked though the concepts stay the same. Create a new Runtime variable named “nui” outside of the Window_Loaded event. When the Window_Loaded event fires, we will call the SetupKinect method that checks to see if there is at least one Kinect plugged in, and if there is, it uses the first Kinect (0 representing the first Kinect) and initializes the Runtime (more details on that later). Me.Title = "No Kinect connected"
You can see how many Kinects are connected by getting the count of Kinects as shown in the code below. Note that for multiple Kinects, you can only have one Kinect do skeletal tracking at a time (color and depth camera work for all) and each Kinect needs to be in its own USB hub, otherwise it won’t have enough USB bandwidth. You can also handle events when the status changes for Kinects that are plugged in. To do this, first register for the StatusChanged event as shown below. When this event fires, it returns a KinectStatus enum with the following possible values: Connected, Error, Disconnected, NotReady, or NotPowered. Dim message As String = "Status Changed: "
Is the Microsoft Kinect Speech Platform not available for download yet or something like that. The link above doesn't seem to actually be a link and it's nowhere on the Kinect SDK pages like the SDK sample says. @alex:It doesn't matter where you put them, if you go to recent files you can browse to them. Once you reference them you should be good to go. If you move them, you might have to re-reference them. Does the speech recognition platform work if your system locale and UI language are not US/English? Uninitialize does not stop the IR projector. 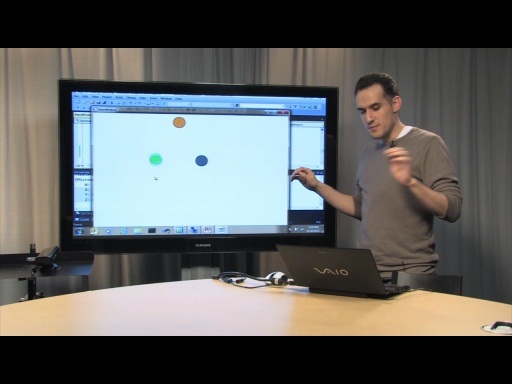 @Bas: The Kinect for Windows Runtime Language Pack (version 0.9) is the acoustic model for the Kinect for Windows SDK. That is optimized for using Kinect as a microphone and is English only. You should be able to use another recognizer that supports multiple languages, but it won't be as optimized as the Kinect Runtime language pack. @Mix: Can you send the inner exception? See if you have an option to "Copy Exception details to clipboard" and respond with them! I installed SP1 for VS 2010, restarted my system, created a new solution from scratch and no longer receive this error. Thanks. @Peter: I have the same problem. Once I run an application once, the IR projector stays on until I actually unplug the Kinect from the USB port. Coding4Fun Kinect Toolkit. Where do i place the Extracted files to bring them up in the reference list? @Jiggles : Use the browse option tab in the add reference window to find them! et voila. That's what I did and worked fine! @Bas Peter: I sent your question to the product team and this is unfortunately a known issue with the driver at beta where the IR projector doesn't turn off. I got an error " Could not load file or assembly 'INuiInstanceHelper.dll' or one of its dependencies. The specified module could not be found." I am attempting a WinForms app, but it did the same, I also tried referencing the dll, and rebuilding - no luck. @Austin: bet you had VS open while you did the install, restarting should fix this. I've logged a bug with the team. And don't forget to add the reference to the Coding4Fun .dll, which can be done (after downloading the .dll from codeplex) in the Solution Explorer by right clicking References>Add Reference>Browse. Could you post the tutorial for C/C++? J'ai un petit soucis. J'ai fait exactement comme cité en haut mais quand je veut générer, tout est blanc et rien n es'affiche. Pouvez-vous m'aidez s'il vous plait? Additional information: Failed in native DLL. HRESULT=0x80080014." I don't know why. And I can't run the demo(SkeletalViewer and the ShapeGame) which is contained in the SDK normally, everytime I double click it (with the kinect connected to the computer ) ,the computer must crashed and with no response, if I don't connect the computer with kinect, the demo can run , but with no picture. I really want to know the reason, if I didnt install the SDK correctly or I didnt install the speech recognition correctly or something else ? any help or ideas as to why this may be happening would be very much appreciated! I had the same problem as kAh00t !!!! Could not find the closed event... why is it not available to me? Found the loaded event no problem. Is there any other language pack for this which is not american version ?? can i have 1 of the finished source code and the design of kinect application for my computer..??? you should try making a video we can actually see. Its so distorted, i cant see what is on your screen. *edit* i mean the video streaming, some of these videos for download are 500mb's! i already plug in my kinect device to the laptop. but when i debug the app, it appeared "no kinect connected". This simply doesn't work on a windows 7 64 bit machine. My kinect is plugged into the wall with a working outlet. All of the devices are listed correctly in device manager. my computer understands that there is a kinect device connected. The Kinect API however does not. The static Microsoft.Research.Kinect.Nui.Runtime.Kinects call returns an empty KinectDeviceCollection (count = 0). Only the audio samples work. I do not now nor ever have had any other other kinect api(s) installed on this machine. also using vs2010 sp1 with .net 4.0. Any one have any ideas? Thanks in advance. Now, running the risk of asking a really stupid question, what is this code supposed show on screen when a kinect is detected? I mean, when there's no kinect conected, it shows the sentence on the window title, just like it's decribed in the code. However, when the kinect is connected, I get an empty white screen. Is it correct? I had stated previously that "This simply doesn't work on a windows 7 64 bit machine." I have since installed the SDK on a Windows 7 64bit desktop. I can now say it actaully does work and it is pretty cool. I am still having trouble getting it to work on my laptop though. I suspect there must be some sort of software or hardware conflict. If I figure out the issue, I will post it here. I dont know if it is related or not but the working computer lists only 1 device icon for the Kinect in the "Devices and Printer" view. The non working environment lists four icons, one for each component (camera, device, hub, and USB composite device). I got kinect working on 64-bit computer also on a laptop. Open ni drivers definitely cause conflict. "Kinects is not a member of Microsoft.Research.Kinect.Nui.Runtime"
I also get this error when I download the project files from the website and try to run them. I actually have the same problem as Matt. All the Runtime stuff is all underlined red. My imports/usings have "exclaimation marks". I have installed everything and still dont work. Quick question..do I need to calibrate first before the head is detected? Is it possible to only detect the upper body and get the skeleton? I'm having a problem with adding the c4f CodePlex dll references. As mentioned multiple times in the above posts, I browse to the DLL's but it doesn't show up on the list of other references. I think the problem may be because I'm using Visual Studio 11 Preview on Windows 8. Is this a known issue? How do I add references in VS11? Or is it better if I stick with the rest of the crowd and revert back to 2010? EDIT: Once I browse for a reference DLL file, it automatically adds it to the project - it doesn't show up on the "Reference Manager" window as shown in the video. my kinect is already connected but when i run the program only shows a white window. Help me. @Nozue do you find a solution? i got the same window. All of the demo's that come with it work awesomely for me, and I've been having a lot of fun working with the camera in my own apps. I'm trying to get into working with some of the Speech stuff though and I'm having a lot of trouble. I know my Speech libraries are installed properly because I can build and run the ShapeGame demo that has a Microsoft.Speech dependency. However, when I try and add that as a reference to my own project, I can't find it anywhere. I've installed the kinect sdk correctly but I can't find the refference "Windows.Reaserch.Kinect"? Please help me. Hello, I found it finally I had to uninstall the kinect version 1.0 that i had, and install the 1.0-Beta version, then just refer to it from the "references" tab under the project. Hi, I too cannot find the Microsoft.Research.Kinect reference. I don't want to be installing Beta versions if I can help it. Is there a resolution yet? This tutorial is out of date -- the link at the top sends you to the new Kinect Quickstart quide. The current version of the Kinect SDK uses the Microsoft.Kinect namespace, however the API has changed, so do see: https://channel9.msdn.com/Series/KinectQuickstart. Go to this website and download the Microsoft.Research.kinect.dll. Restart your VB application and then you can find the above mentioned reference..
Can anyone help me with the details that I have the data captured(video files and depth data detail files) for the working but I don't have Kinect currently with me. In a nutshell I want to work on the captured data files offline..What should I do to open file in C#??? i have tried other computers and the the same error apear each time !